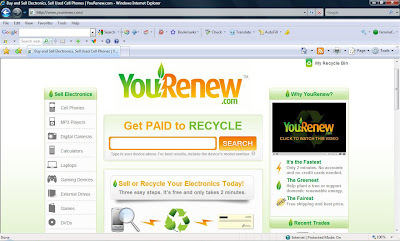 You Renew, a recycling business founded by two Yale students, a company whose main goal is to recycle old unwanted electronics. You hand them your old cell phone or laptop, they check it out and pay you its worth. It's a win win, both sides satisfied. For every device they take in, a contribution is made to the environment. For now, the two friends are not getting that much profit. Yet they don't mind due to them still being students. They just hope the environment is benefiting from this. If you are inside the United States, You Renew sends you the packaging for yu item and so its free. However, they do not offer free shipping from outside the US.